Manny Pacquiao proves once again that he is a true blue champion! Manny Pacquiao weighs at 150 pounds, while his opponent in the ring, Brandon Rios weighs at 159 pounds. Rios is also taller and has longer reach than Manny Pacquiao. Their fight was labelled as “Clash in Cotai” that was held today, Sunday, November 24, 2013, in Cotai Arena in Macao. David Beckham visited Manny Pacquiao in his dressing room before the start of the fight. Apl de Ap of Black Eyed Peas, Paris Hilton, Miguel Cotto were also present. So as my good friend Lane, Andrea and Dr. Jansen who watched the fight live in Cotai, Arena, Macao. 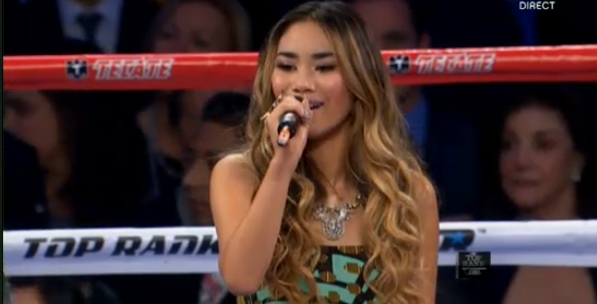 Jessica Sanchez, two in one performance. She gets to sing the national anthem for both the United Stated and the Philippines. Handsome Rios before the fight. 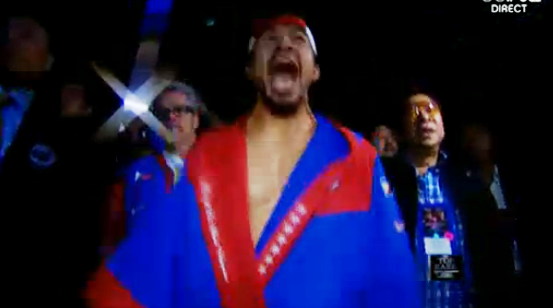 Manny Pacquiao is fierce. Hungry for the World Title Belt! Manny is ready to fight. Round 1 Manny "Pacman" Pacquiao is wearing his advertisement filled blue shorts and Brandon Rios is wearing a cement bag look a like white shorts. Manny approaches Rios with a jab. It seems they were trying to gauge one another. 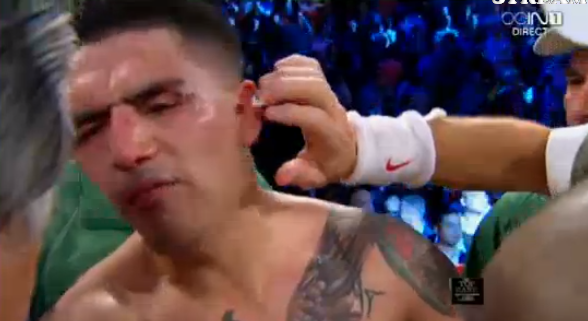 Rios did not try to land a punch on Manny. The first punch to really connect is a left jab to the head by Pacman. The crowd cheered for Manny. Manny Pacquiao's speed seems to bother Brandon Rios. Then Rios went down on his backside. The referee rules it as a slip and Rios gets some good shots in when the pair grapple. 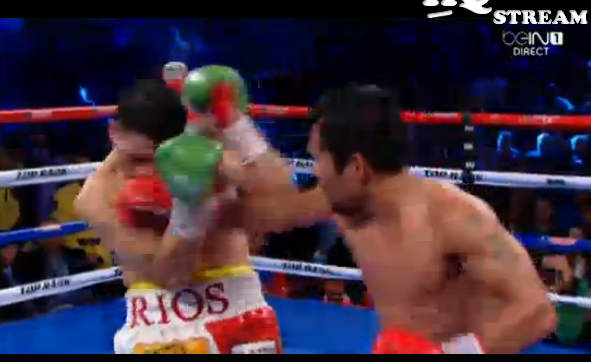 And just before the final bell Pacquiao lands a strong left to Rios' head. Round 2 Brandon Rios finally had the balls to go forward towards Manny Pacquiao at the opening of the second round, landing some seemingly strong body shots. 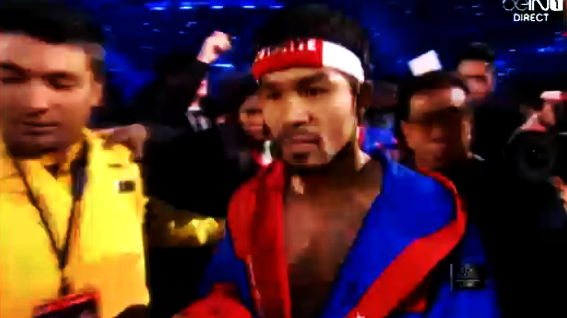 Pacquiao was forced to dance a little more than usual. 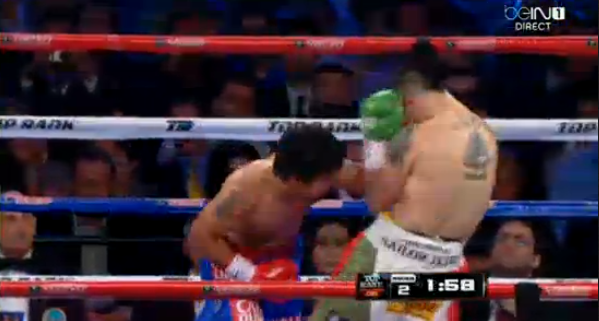 After 90 seconds of Rios looking the aggressor, Pacquiao finally counters with a flurry of combinations. In the final ten seconds Pacquiao again lands a series of headshots. Round 3 It seems as if Pacquiao is at his best with strong shots and athleticism in the ring. Rios made a brief rally early in the round when he trapped Pacquiao in a corner. But Pacquiao responded with some strong counterpunching in the middle of the ring to likely win the round. But it was Rios’ best round. 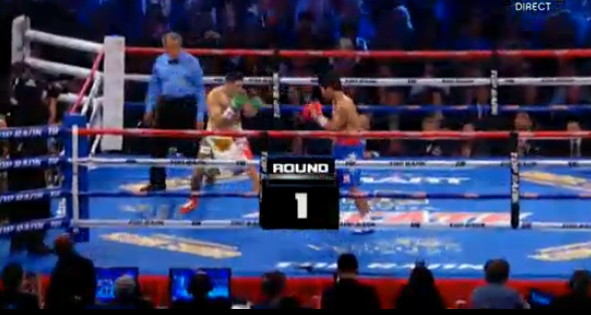 Round 4 Pacquiao seems to be in complete control of the fight. His left jabs seem to have confounded Rios. While neither fighter seems to be in distress, Pacquiao is running a clinic on how to win a fight. It’s now a question of how long Rios wants to put up with this. Round 6 Manny Pacquiao started the round with a strong left-right combination but he seems to have settled down a bit. But as the round progressed Pacquiao got stronger with combinations and even drew a little blood around Rios’ right eye. The question now seems as if Rios can win a single round or be shutout. Round 7 Anyone who doubted Manny Pacquiao needs to reconsider the future of the 34-year-old boxer. He looks young and fresh, and his left jabs seems sharp as ever. This round crosses over that Rios would need a knockout to win the fight. Pacquiao holds a 172-88 advantage in punches landed. The crowd was chanting Manny's name. Round 8 They're not fighting in some instance. Their arms are locked. Manny is not as active in this round. If there was a round that Rios could win, this was it. Pacquiao looked a little unsettled and Rios even landed a left shot that connected with his face. But a late flurry by Pacquaio brought the round back to him as Rios looked distressed around the eyes and nose. Round 9 More of the same as it becomes apparent that Pacquiao’s only remaining goal is to pitch a shutout. Rios showed a late flurry but it was answered by strong, sharp connections by Pacquiao. Rios isn’t hurt but he is surely beaten. Both eyes are swollen. Rios could not catch Manny. Manny is too fast for Brandon Rios. Rios is still standing up but the round once again belongs to Manny Pacquiao. Round 10 Pacquiao continued to dominate his overmatched opponent, scoring easily with punches that seem to sting but not hurt. Rios is hoping just to make the 12-round finish with no chance of winning the fight. Only a miracle can give Rios the win. Rios was given another warning by the referee. Rios got in. But it is nothing seious. Manny Pacquiao is very careful. Round 11 An early flurry by Pacquiao got the crowd excited but Rios seemed determined to finish the fight. Pacquiao’s left continues to connect with modest damage against a fighter that only has a puncher’s chance to win. The pace of the fight seems to have slowed but Pacquiao’s dominance has not. Brandon was left with a cut on his cheeks and left eye. Brandon Rios even lift Manny Pacquiao to stop him from beating him. Manny is aggressive in this round. Manny is doing a lot of foot work. 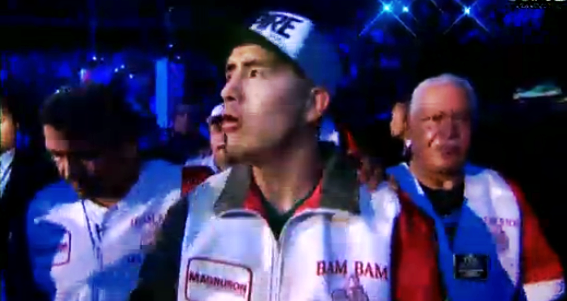 Brandon Rios has taken a beating from Manny Pacquiao. Round 12 The final round started with Rios realizing he had only one chance and that was knockout, but it was clear that the Manny Pacquiao that captivated the world was still around. He jabbed and hit at will. The fact that he didn’t drop Rios will not be remembered as a fight that Pacquiao did not close but more that he is as dominant as he ever was. Both men are still standing at the end of round 12. Brandon Rios got a boxing lesson from Manny Pacquiao. He looks like a beaten boxer at the end of round 12. Manny Pacquaio wins by unanimous decision! He is back! #MannyPacquiao #DominantVictory #BackOnTrack. The judges are Michael Pernick (Florida), Lisa Giampa (Las Vegas) and Manfred Kuchler (Germany).